With emphasis on Environmental Medicine, Dr. Sponaugle specializes in treating brain and neurological disorders derived from Neurological Lyme disease, Mold Toxicity, Industrial Toxicity, Gut Toxicity, and five additional stealth infections that are attacking the Brain and Neurological system. Dr. Sponaugle approaches healing on an intracellular level using biochemistry and detoxification protocols to optimize mitochondrial function. In addition, he was awarded one of four scholarships, given each year by the state of West Virginia, to exceptional PREMED students for matriculation at the WVU School of Medicine. After receiving my Medical Degree at WVU, he began an Internal Medicine residency at Charleston Area Medical Center with the intent to become a cardiologist. While performing my Internal Medicine Internship, I become disillusioned with several aspects of Internal Medicine; particularly Oncology and Rheumatology. With a love for Cardiology, Pulmonology and Intensive Care Medicine, I left my Internal Medicine Residency to seek specialty training in Intensive Care Medicine at the University of Florida. I chose an Anesthesiology Residency at the University of Florida, because the Anesthesiology department was leading the country in pioneering new modalities of Intensive Care Medicine. For that reason, the department offered experience in medical care for multiple modes of intensive care units; the Pediatric ICU, the Surgical ICU and the Burn ICU. The Anesthesiology Chairman, Dr. Jerome Modell, and his professors, invented a ventilator therapy, called PEEP, which revolutionized the treatment for drowning. They had also invented CPAP (PEEP without an endotracheal tube) and, later, IMV (Intermittent Mandatory Ventilation). Treatment modalities invented by Anesthesiologists at the University of Florida have been utilized in Intensive Care Units throughout the world. The Anesthesiology department also directed NASA’s Hyperbaric Chamber. Located in Shands Teaching Hospital and capable of simultaneously treating six Astronauts, it was the largest Hyperbaric Chamber in America. Prior to leaving my Anesthesiology Residency, I performed additional training in Pain Management which, in the early 1980s, was an emerging specialty like Intensive Care Medicine. In 1985, I began practicing Critical Care Medicine and Anesthesiology in Tampa Bay. I served a cumulative total of 14 years as Chief of Anesthesiology for two different Tampa Bay hospitals. As Chief of Anesthesiology, I was responsible for ascertaining quality control and implementing safety protocols in multiple critical care areas. I also served multiple years as the Medical Director for three different outpatient surgical centers and one year as the Medical Director for the Watermark Pain Treatment Center. While treating chronic pain patients in the late 1990′s, I became aware that America’s rehab centers were not controlling dangerous surges of adrenaline while patients were attempting to detox from Opiate pain medication. In 1998, I used my Cardiac-ICU skills and a computerized heart monitor, trans-esophageal echocardiography, to pioneer a much safer and less painful opiate detox. My detoxification technique has been featured on ABC, CNN and the Dr. Phil show. After referring patients to AA, NA and 28 day rehab centers from 1998 to 2000, I became disillusioned with talk therapy programs. I hypothesized that most addicted patients continued to relapse, because they suffered from inherited or acquired Brain Chemistry issues. By the year 2000, I became fascinated with the emerging field of Brain Science and began reading SPECT and PET Brain imaging studies from all over the world. In 2004, I became Board Certified in Addiction Medicine, but I found that Addiction doctors were vastly ill-knowledgeable regarding advances in Brain Science. For this reason, I began performing unprecedented research correlating my patients’ drug craving patterns with abnormal findings on their SPECT brain imaging, as well as specific neurotransmitter deficiencies and imbalances seen in their Brain Chemistry analyses. My clinical research has proven that patients use Dopaminergic drugs to stimulate underactive brain regions that are inherited or acquired by toxin-induced malnutrition and neurotoxicity. 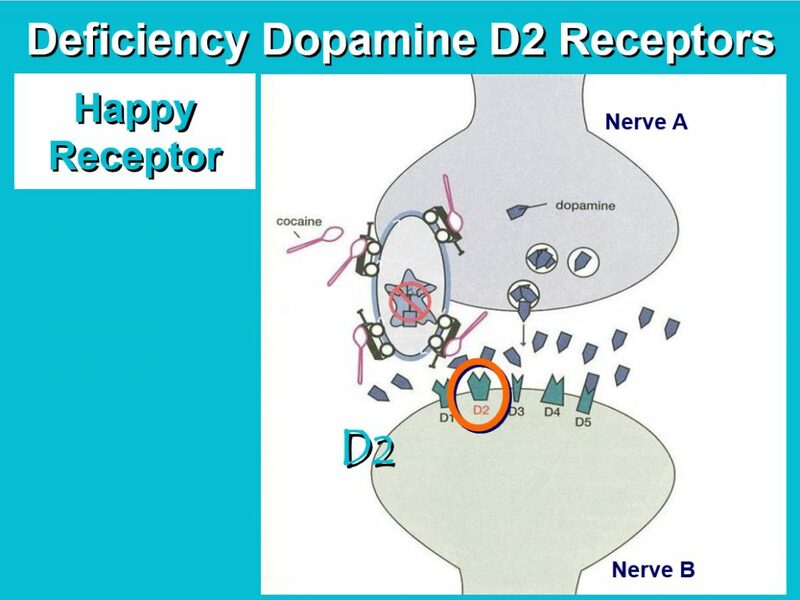 Dopaminergic drugs trigger a temporary release of Dopamine from brain cell storage units into the synapse; the space between two brain neurons. My additional research proved what should have been obvious to all addiction specialists; that addicted patients were self-medicating with calming drugs to quiet their overactive [over-electrified] brain regions. By 2006, using neurotransmitter analysis, I prescribed herbal supplements to balance Brain Chemistry and calm electrical circuits in the brain. Doing so enabled me to achieve the lowest relapse rates in America. For this, I was invited to speak at the Whitehouse. However, I knew in my heart that balancing Brain Chemistry and preventing relapse wasn’t good enough. I wanted to know and understand the underlying medical disorder that caused the abnormal Brain Chemistry patterns that subsequently caused the patient to self-medicate with drugs or alcohol. My most complicated and most laborious research has taken place since 2006: research performed in an attempt to diagnose, in each individual patient, the various underlying medical disorders that are causing sickness and “electrifying” changes in neurotransmitter patterns, Brain Chemistry imbalances that subsequently up-regulate the flow of electrical current in the Brain and peripheral nervous system – Neuroexcitotoxicity. My clinical research has correlated patient symptoms and intensity of sickness with over 9,000 Neurotransmitter patterns, 6000 Mold Mycotoxin levels, 2000 Industrial Toxin levels and thousands of mathematical biomarkers for Gastrointestinal Dysbiosis [Candida and SIBO biomarkers], Immune Dysfunction, Stealth Infections and Genetic testing. 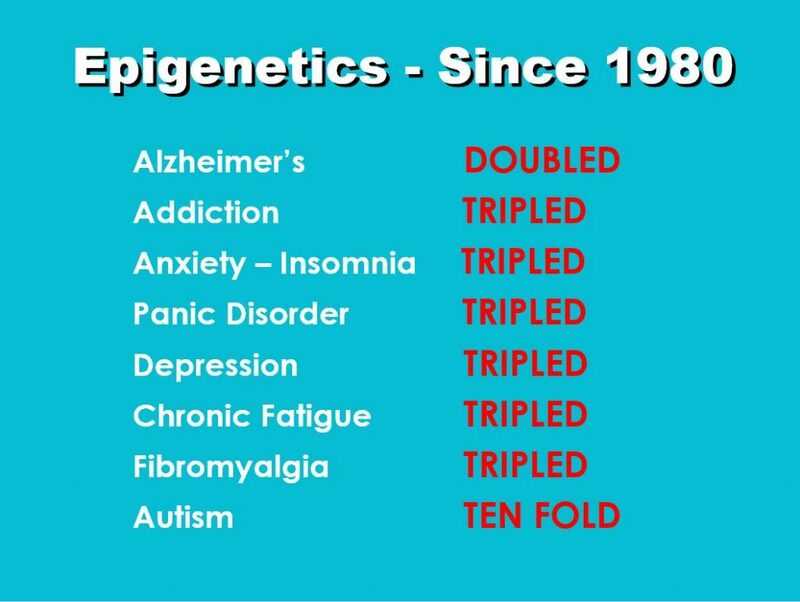 Through this intensive research, I have determined that most “sick” patients are suffering far more from Epigenetics than Genetics. Furthermore, common sense dictates that the Gene Pool could not change enough, in just 30 years, to cause the exponential surge of psychological and neurological disorders seen in the image.